Whilst poetry and fiction have been subjected to extensive linguistic analysis, drama has long remained a neglected field for detailed study. 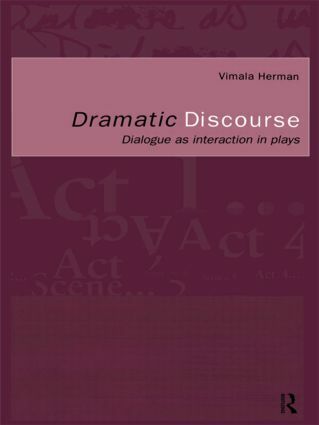 Vimala Herman argues that drama should be of particular interest to linguists because of its form, dialogue and subsequent translation into performance. The subsequent interaction that occurs on stage is a rich and fruitful source of analysis and can be studied by using discourse methods that linguists employ for real-life interaction. Shakespeare, Pinter, Osborne, Beckett, Chekhov, and Shaw are just some of the dramatists whose material is drawn upon. Each chapter contains a theoretical section in which major concepts of each framework are explained before the relevance of the framework to dramatic discourse is analyzed and explored using textual examples. This book will be of interest to undergraduates and postgraduates studying in the areas of literary linguistics and stylistics, or anyone specialising in the relationship between the text and performance.